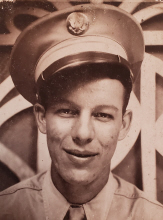 Eugene Peterson, 94, of Mattoon passed away on March 20, 2019 at the Odd Fellow-Rebekah Home. Funeral Services honoring his life will begin at 11:00 a.m. on Saturday, March 23, 2019 at Schilling Funeral Home with Pastor Dennis Strawn officiating. Burial with Military Rites will follow at Dodge Grove Cemetery. Visitation for family and friends will be held from 10:00 a.m. until the time of the service on Saturday at the funeral home. Eugene was born September 2, 1924 in Mattoon, a son of Otis and Loree Tanner Peterson. He married Mary Louise Behl on October 19, 1946. She passed away on November 7, 2013. Surviving are three children, Cheryl Ferguson of Las Vegas, NV, Roger Peterson (Marsha Hudson) of Mattoon, and Randy (Patty) Peterson of Mattoon, nine grandchildren, eight great-grandchildren, three great-great grandchildren, and many nieces and nephews. He is preceded in death by his parents; one sister and two brothers; his wife, Mary, of 67 years; and a grandson. Eugene served in the US Army, 16th Infantry in WWII, which was a part of the Normandy invasion. His infantry landed on Omaha Beach on D-Day. He marched across Europe to Hitler’s Hideout. He earned four overseas service bars, four bronze battle stars and several other medals for his valor. Eugene was an accomplished carpenter, building homes for IBC in Mattoon, and working on home improvement projects. In his final work years, he was the maintenance supervisor at Lincolnshire Apartments in Charleston. Eugene was a member of the Moose, Eagles and VFW and enjoyed traveling and working on projects in his garage. In lieu of flowers, memorial donations in his honor may be made to Peace Meal, 694 Castle Drive, Charleston, IL 61920. To send flowers or a remembrance gift to the family of Eugene Peterson, please visit our Tribute Store. "Email Address" would like to share the life celebration of Eugene Peterson. Click on the "link" to go to share a favorite memory or leave a condolence message for the family.